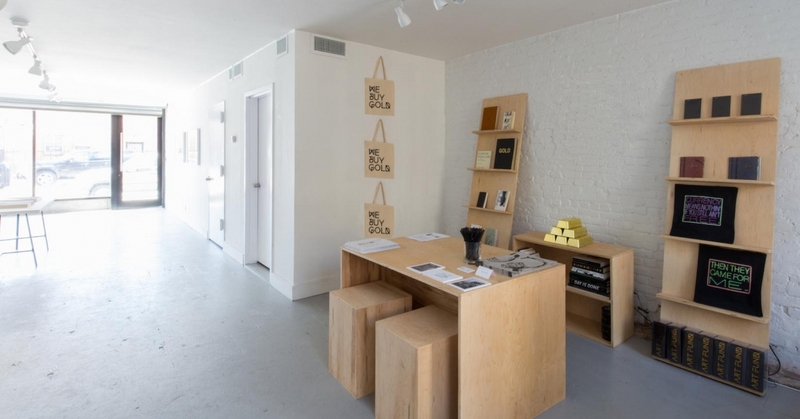 The roving art space We Buy Gold, which Joeonna Bellorado-Samuels opened in Bed Stuy in March, is successfully managing a tricky balancing act: it is seriously and coherently embedded in its space and moment, even as it resists barricading itself into a particular corner. We Buy Gold also manages to engage directly with some of the stickier aspects of transactionality and value in contemporary art without wading into polemic or reduction. It’s a graceful, thoughtful way of considering the gallery’s role—how it defines commodity, how it changes its environment—while remaining open to being transformed by it. Bellorado-Samuels lives in the neighborhood, as do many of the artists connected with the project; the doors are open, front and back; the small bookstore is welcoming; and, if it feels like a bit of Chelsea polish on Nostrand Avenue, the effect is less a jarring incursion and more a pleasantly surprising confluence of worlds. If conceptually We Buy Gold is, as a commercial art space, about a tight network of relationships and interactions, and about the insights this model provides into the mechanics, semantics, and modes of exchange of contemporary art markets, the works on display in the inaugural show, ONE., cogently carry through these concerns in formal and thematic terms. 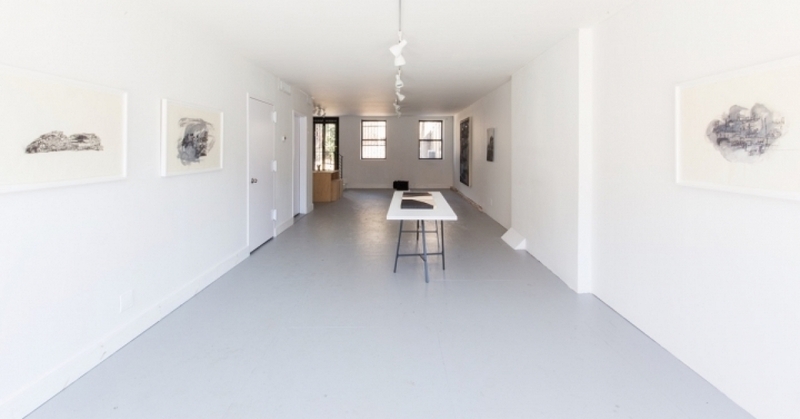 On view are works by three artists working in varied mediums: three drawings by Renee Gladman; two sculptures and a painting by Torkwase Dyson; and a photo-based work and sculpture by Harold Mendez. 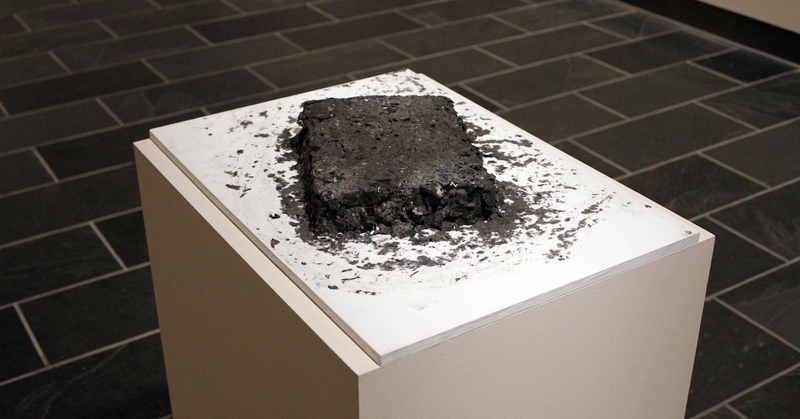 Each artist’s works are bound among themselves, to the other works in the show, and to the space, by a loosely shared network of thematic and formal concerns: monochromatics; legacies of colonialism, slavery, and trauma; the physical presence of the artist’s hand; the eruptive, unpredictable modalities and vocabularies that the work can intrinsically, unpredictably, demand or reveal. Gladman, who has had a long and distinguished career as a poet and is on the poetry faculty at Brown, has made three intricate, delicate works on paper, in varying combinations of ink, pencil, and gouache. At 24 by 36 inches, the works are intimate but substantial in scale; they quietly command focused, inward-peering attention, without being so large as to dominate the wall or overwhelm the physical space. Against a warm ivory background, Untitled, Cities: Axes (2016) is a nimbus of gouache in washes of gray. Asemic symbols and vaguely architectural structures seem to erupt, almost against someone’s will, from the gouache; they are anchored by a pale pencil axis, nearly centered on the paper. Considered in purely visual terms, it is a loose but complete composition, executed with the confidence to let disparate elements and qualities—inked structure, shadow, open space—breathe and harmonize. In conceptual terms, it’s strikingly, literally poetic: the ineluctable unit of measure, for the poet, remains the line, transmuted here into a startlingly clear visual tangle. 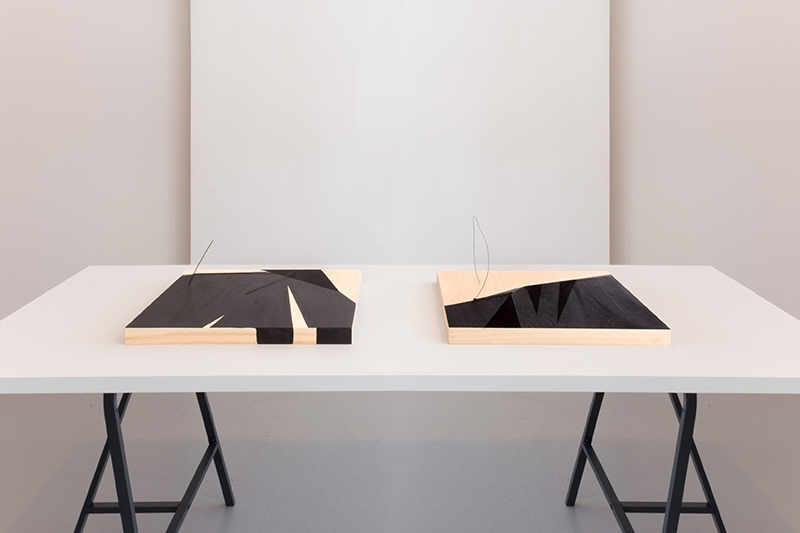 The pale washes and delicate lines of Gladman’s work, and the writing at its heart, find eloquent interlocutors in Torkwase Dyson’s two sculptures, displayed on a table in the center of the space. 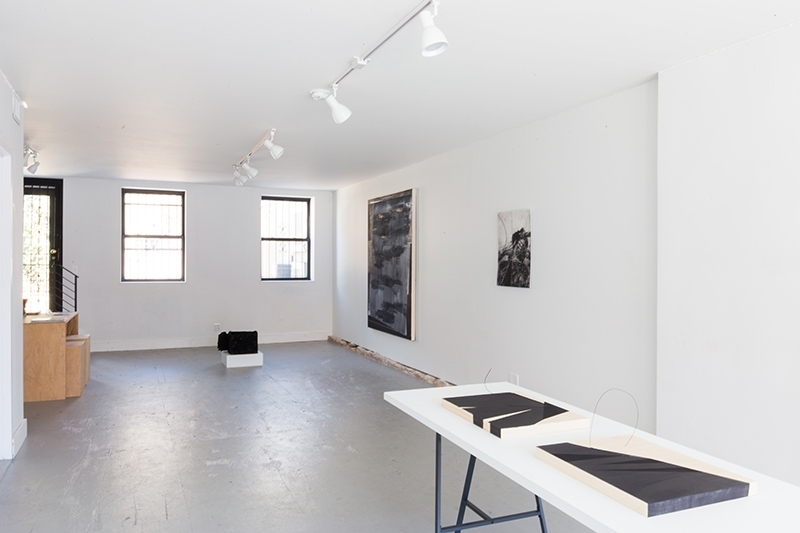 The sculptures, Before Black Mountain and the Anthropocene (Tuareg Women: Namadcity) (2017), and Black Compositional Thought (Tuareg Women: Namadcity) (2017) both began as drawings. Dyson has the rare ability to listen deeply to the formal demands of the work and make changes and progressions in increments that are subtle and responsive. Before Black Mountain and the Anthropocene strains patiently, smoothly, to grow from the flat into the three-dimensional space. A single arcing wire is the taut manifestation of the sculptural imperative; the slight shadow it casts on the wood suggests a sundial, the tectonic passings of time through which Dyson guides the forms. In Black Compositional Thought the sharp delineations of space create uncanny hard-edged perspectives that recall Carmen Herrera’s Blanco y Verde (1959). If Dyson’s sculptures deal with the conditions of power, and the attendant violence, through a sequence of tension-filled spatial and chromatic abstract interactions, Harold Mendez’s takes a more explicit approach. let X stand, if it can for the one’s unfound (After Proceso Pentágono) II (2016) shows an anonymous man’s head being grabbed and damaged by anonymous hands; the infamous electric shock torture of dicatorships across Latin America is clearly visible, the calipers connecting to his ear. The paper itself looks crumpled and traumatized, like a discarded, abandoned history. It is hung next to Dyson’s Value and Resources (Water Table #10) (2017), an intelligent pairing that effectively juxtaposes more immediate political history with the simultaneously more personal and universal changes of water moving over matter over time. Where Mendez’s paper looks like it’s been balled up in a fist, the elegant, minimal lines that edge Value and Resources suggest the careful, but inescapably human restraint of a single, deliberate finger. Because the space is not large, and because the presence of nature, in the form of a sun-filled garden (and attendant impromptu soundtrack of birdsong), permeate the experience of the work, the tightness of these themes and connections is highlighted in their restraint and careful relative placements. 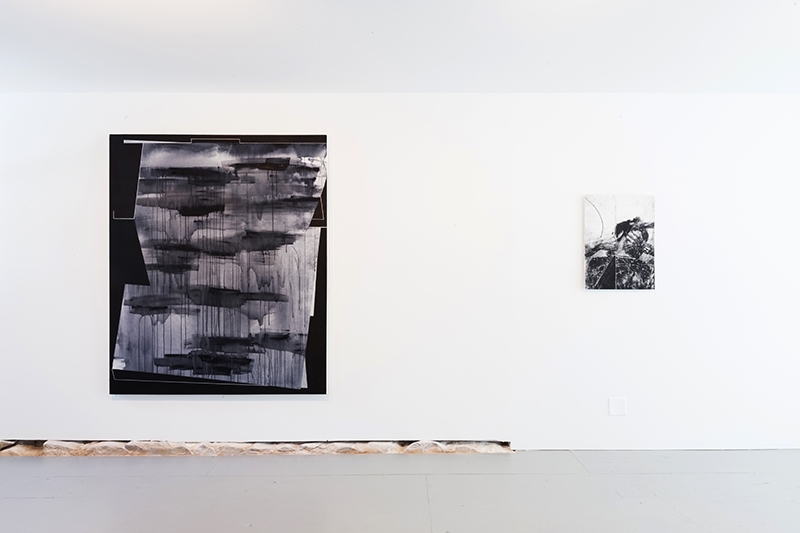 Gladman’s drawings move the eye intuitively to Dyson’s sculptures; Mendez’s black sculptural box holding a pre-Columbian death mask (Untitled, Death Mask) (2015) exerts a gut-deep pull as one faces his photo and Dyson’s water table painting, like the rising-hackles feeling of realizing someone is looking at you from behind. Ultimately, ONE. succeeds because it renders nearly tangible the nuances of connection between works and each other, between works and viewers, between art place and world space. It’s an effective, enervating reminder of the potency of a coherent vision, paired with open doors and open to interpretation.